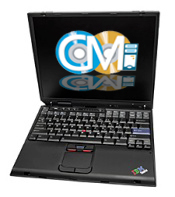 We have a steady supply of refurbished IBM Thinkpads for sale. These laptops are perfect for business applications or for personal use. They can be loaded with your choice of operating system and the hardware to fit your needs. Full 6-month warranty with repairs done locally and quickly (optional 12-month warranty upgrade available). 512Mb of memory (optional 1 Gb memory upgrade available). Windows XP Pro (other operating systems installed upon request).